This example uses a simple C chord all the way through, so that you can concentrate on the picking. Each string is picked (or plucked) in turn (first the g-string with your thumb, then the C-string with your index finger, and so on). Make sure that you let the notes ring into each other so that by the time you’ve picked all the notes a full C chord is ringing. To start off with, play the notes as slowly as you can. The important thing is to keep the tempo as even as possible. When you’re comfortable playing it, increase the speed a little at a time. At the start of the phrase, all the fingers are touching the strings: This position gives you plenty of time to get each finger positioned. When you get the hang of the pattern, try changing chords while playing it. To get the hang of this pattern, listen to this audio clip of up-pattern picking. It starts with a simple up-pattern progression, moves into chord changes between C, F, and G7 chords, then demonstrates how the up pattern can sound quite complex. The last part of the audio clip contains a neat little trick. The chord variation right before a chord change introduces a note from the chord that’s coming up next. 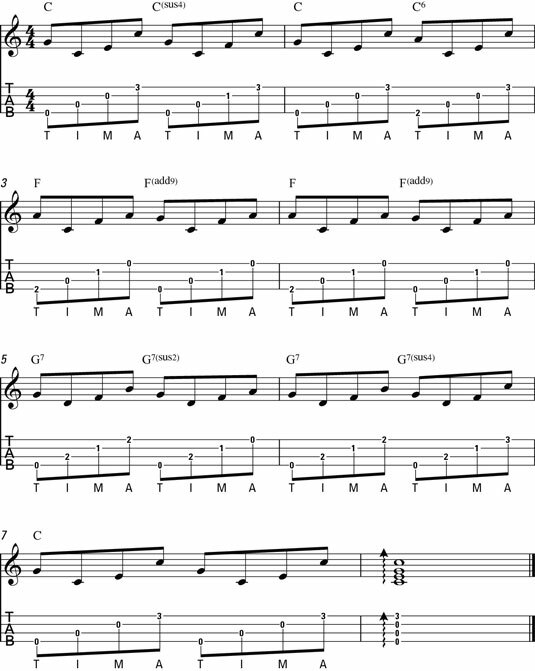 For example, at the end of bar 4, an open g-string is added to the F chord to transition into the G chord. This technique is a nice way to lead from one chord into the next, and you can do it with strumming as well as with picking.